(Reuters) – Rugby Australia (RA) said on Wednesday that fullback ,Israel Folau’s latest anti-gay comments on social media were “unacceptable” and its integrity unit would look into the matter. Wallabies international, Folau, one of the nation’s top players and most marketable athletes, wrote on Instagram that gays would be condemned to “hell” if they failed to “repent”. New South Wales Waratahs player, Folau, an Evangelical Christian, made similar comments last April. “Rugby Australia is aware of a post made by Israel Folau on his Instagram account this afternoon”, Australian rugby’s governing body said in a statement on Wednesday. “The Rugby Australia Integrity Unit has been engaged on the matter tonight”. Folau, 30, also took to Twitter to condemn a landmark decision on Wednesday by the Australian state of Tasmania to make it legally optional to list gender on birth certificates. 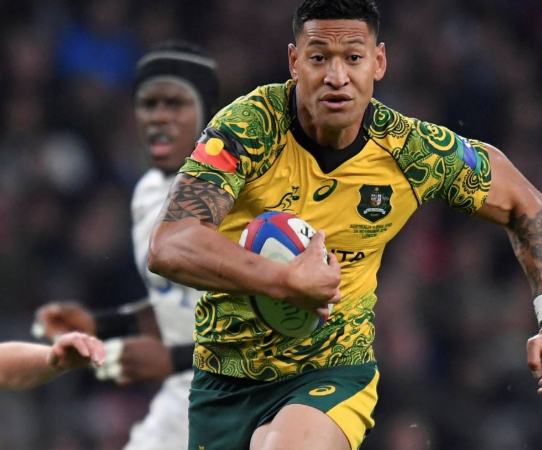 In February, Folau extended his Wallabies deal until 2022, ahead of this year’s World Cup, although contract negotiations were complicated by his conservative religious views. Folau faced no sanctions in April last year for anti-gay comments, after RA said it accepted his position that he did not mean to harm the game.